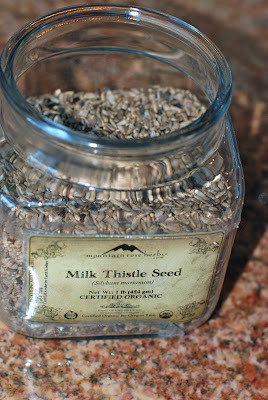 I love milk thistle seed! It's one of my favorite herbs to take, as it is so beneficial for the liver. Since the liver is such a critical organ in our body, we need to take good care of it, and milk thistle is an excellent herb to take for liver support. Again, these are just a FEW of the many functions of the liver...so you can see the importance of supporting the liver and keeping it healthy! Milk thistle can be taken in three different forms; capsules, tincture, and tea. 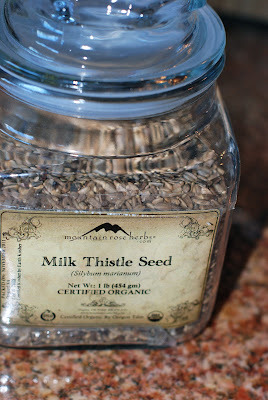 There are different benefits that can be derived from taking it in each of it's three forms, so I recommend rotating how you take your milk thistle seed. Try rotating through a tincture form, then capsules, then making your own tea. To make a milk thistle tea, crush 2 teaspoons of seed with a mortar and pestle, then pour one cup of boiling water over the seeds and allow to sit for 30 minutes before you drink. You can drink one cup a day. You can buy organic milk thistle seed at Mountain Rose Herbs by just clicking on my link to the right. As with any herb, I do recommend taking a break and not taking it daily for extended periods of time unless you are under the guidance of a certified herbalist. I am not a licensed medical provider and the information in this post should not be construed as medical advice. If you chose to use milk thistle seed, you will be taking responsibility for your own health and wellness; the FDA has not evaluated this herb. I just love your posts Jessica-so informative! I've been wanting to use some herbs to cleanse my liver. I'll be getting some Milk Thistle soon. Isn't Mountain Rose Herbs awesome by the way?! Thank you, Laura! I do love Mountain Rose Herbs and that is where I buy all my herbs. It takes a lot of self control not to order their entire store! You will love Milk Thistle...one of my stand by herbs. Jess, can you tell me how much capsuled milk thistle you might take per day? Also, when you mention going off an herb for while, how often do you recommend staying off it and how often would you recommend taking the designated break? Thanks, Jess! All the capsulated milk thistle will have directions on how to take their supplements. I do recommend breaks but because I do not know your particular health situation and I am not seeing you professionally, I am not able to make that recommendation legally. I hope you understand. I would recommend discussing that with an herbalist in your area and doing some of your own research on milk thistle.